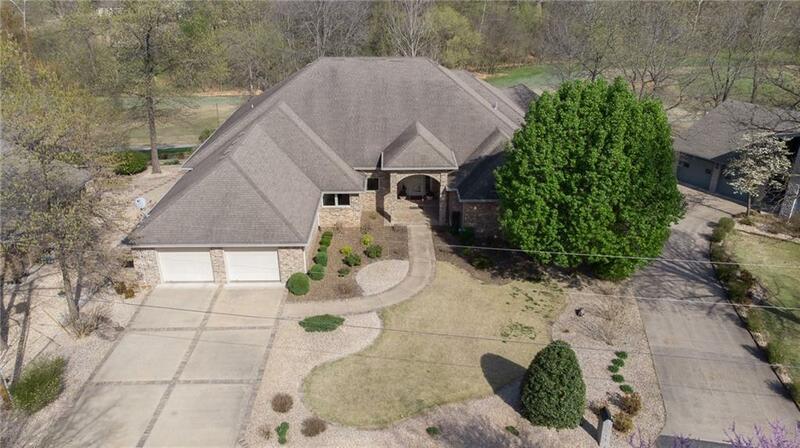 Serene Easy Living w/ Elegance on golf front, cul-de-sac property. Built by the renowned Don Seba. Immaculate timeless floor plan & amenities. From beautiful beveled glass front door, step into an open concept living area w/ magnificent granite gas FP, high angular ceilings, floor to ceiling windows overlooking 13th Green/Highlands. Enjoy the all brick decks & all brick exterior. Abundance of natural light in every room. Impressive eat-in kitchen has double ovens, granite, pantry & fabulous fully glassed dinette. Peaceful sunroom opens to large brick columned deck. Master bedroom w/floor to ceiling windows & M/Bath is a show piece w/ walk-in 4x8 cultured marble shower, vanities, includes large closets, with built-in dresser, shelves & storage. Beautiful laundry room flanked by craft room, encapsulated basement & 3 car tandem garage. Too much to list, floor plan & amenities are timeless. No updating needed. Newer hyper-allergenic HVAC system. Come see to believe at this affordable price.